The nature of small museums (limited staff, busy schedules) sometimes necessitates that we build an exhibit very quickly. We thought you’d like to see how we do that, so as I dismantled the temporary exhibit we built for our 2009 Garden Gala, I took pictures, which are presented below in reverse order with explanatory text. It took us approximately an hour to build this exhibit. 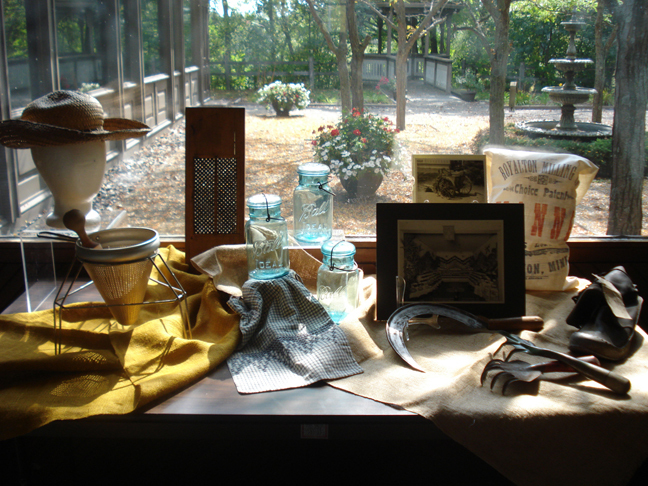 Prior to assembly, we picked a theme (gardening) and pulled a variety of items from our collections room, library, and archives that we thought might work in our exhibit. This, of course, adds to the one-hour assembly time, but even within the hour it took for actual assembly, we were still retrieving items (both artifacts & exhibit furniture) from around the Weyerhaeuser Museum. It’s important to note that you don’t have to know exactly what’s going into the exhibit before you start the assembly work, but you should have a general idea. 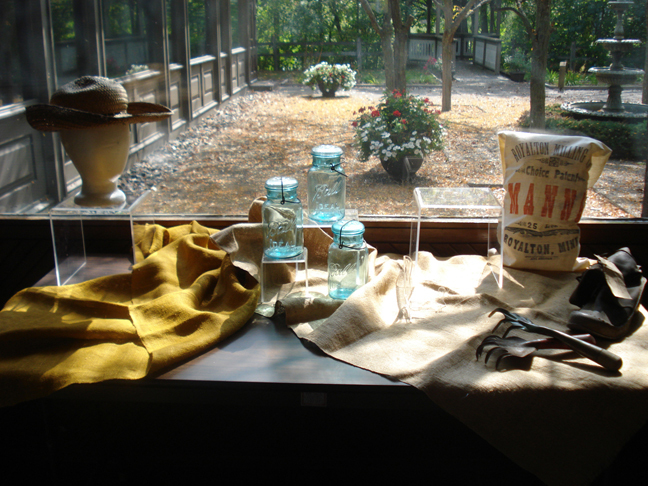 Picking a theme helps to organize your exhibit and narrows down the choices of what to exhibit. Having too many things to choose from is as difficult as having not enough when it comes to building an exhibit. 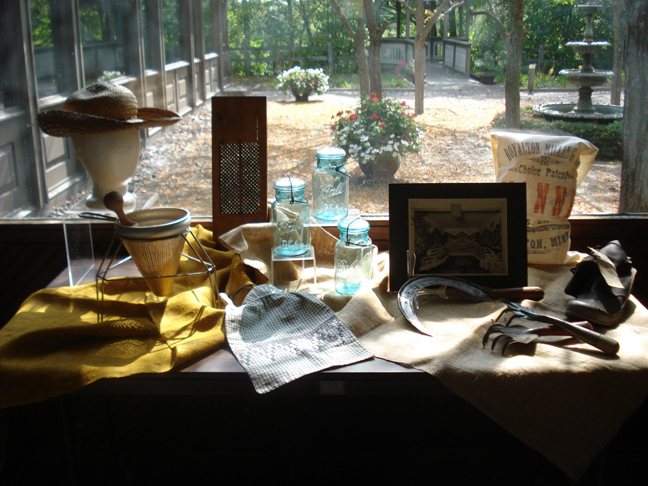 You’ll also want to select a variety of types of items to exhibit – artifacts made of different materials, photographs, books, and documents. This variety will automatically lend visual interest to your exhibit. 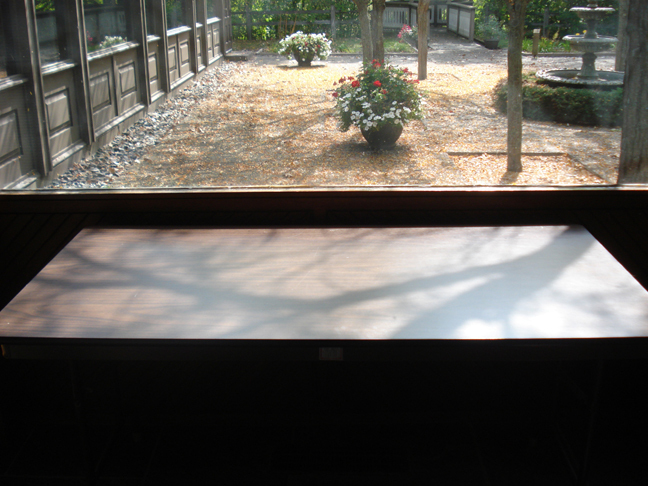 An ordinary table serves as the base for our exhibit. This one is 5 feet long x 2 1/2 feet deep. While having exhibit cubes or cabinets … something that can be closed to protect the exhibit … is nice, it isn’t always necessary. 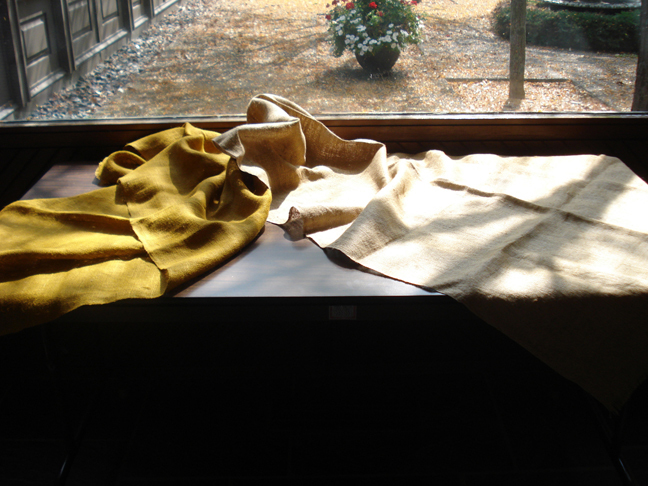 The basic rule in a museum is that if an artifact, book or document is left out in a public area, it will be handled by visitors, even if there is a “Do Not Touch” sign nearby. 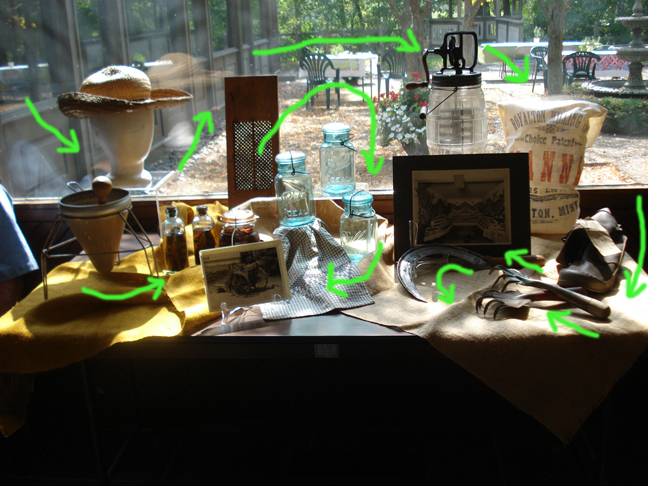 The exception to this rule tends to be if artifacts appear to be purposefully arranged. It’s not foolproof, but most people will respect the arrangement. Add some fabric, artfully arranged. We chose burlap to fit our garden theme. The choice of fabric is up to you. We could have chosen a plain fabric in a single color or something with a subtle, garden-related print. The point of the fabric is to serve as an interesting backdrop to your exhibit while not over-powering the items being displayed. 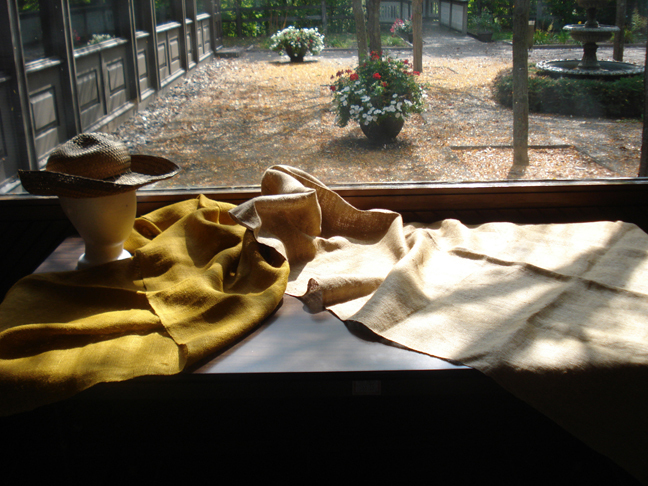 The fabric can also be used to cover exhibit furniture that is less than attractive. We keep a variety of random pieces of fabric in different sizes on hand for these sorts of occasions. This keeps us from having to trot off to the store to buy fabric when time is short. The first piece is added - a straw hat. 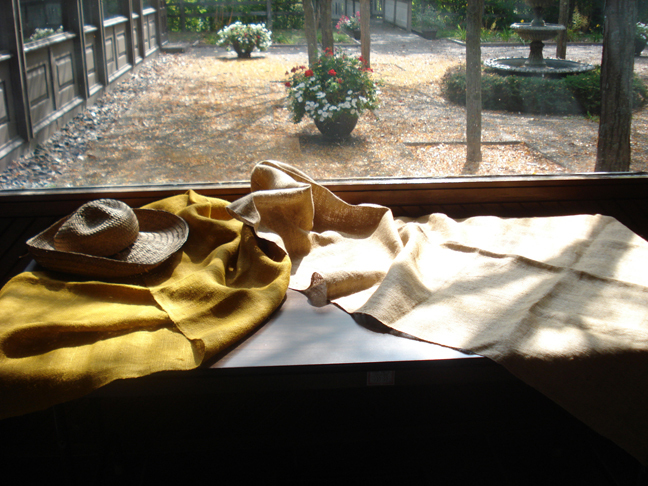 This straw hat HAD to go in the exhibit. It was a given for me. Likely, you’ll have some piece that you must use on your exhibit. Plop it in right away and give it a place of importance. I could immediately see that I was going to have to elevate this hat because it blends in to the burlap. The straw hat on a mannequin head. A Styrofoam mannequin head gives the hat the lift it needs. We have several mannequin heads in storage for use with our hat collection. 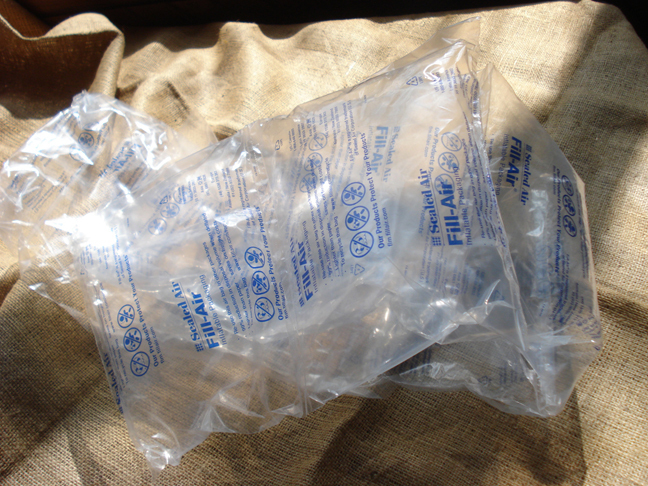 Inflatable packaging for shipping. What could this be for? 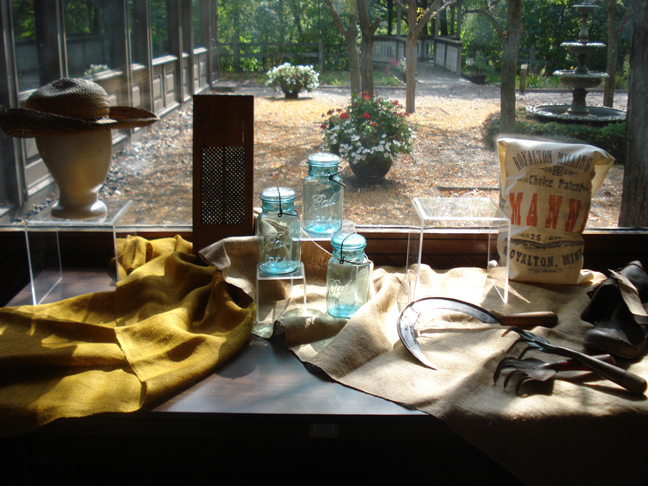 All sorts of everyday items can aid in exhibit building. We save inflatable packaging from stuff that gets mailed to us. According to our curator, the inflatable packaging and Styrofoam heads are inert materials, good for use with museum artifacts. We repurposed the inflatable packaging like this …. ... in a flour sack. We could have left the flour sack deflated, but by adding the inflatable packaging, we gave it extra dimension. 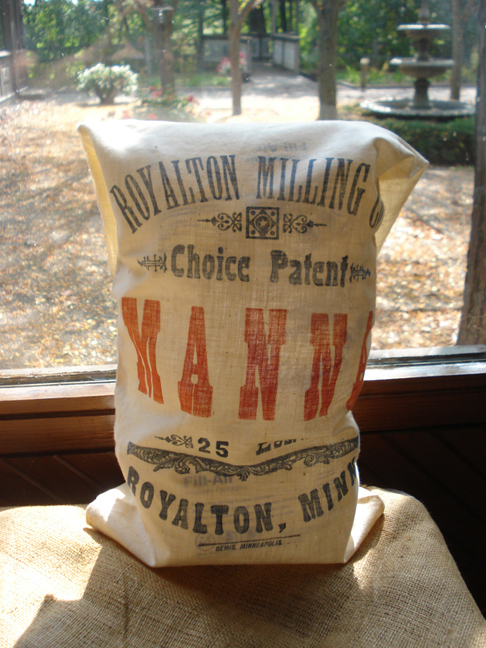 The flour sack is also easier to display upright with stuffing. 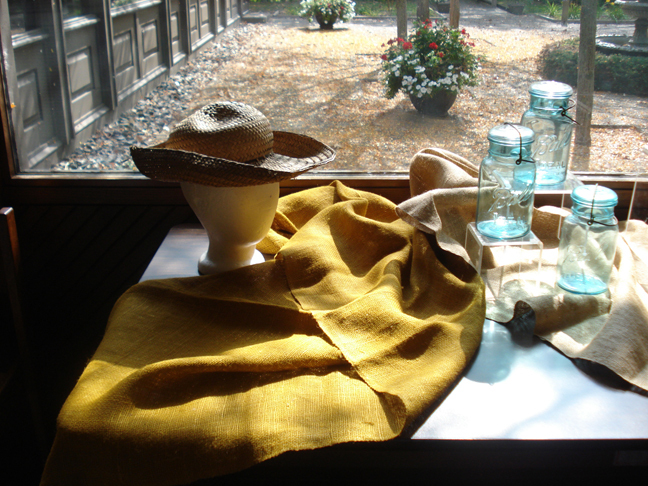 Here's what we have now - an exhibit with a straw hat and flour sack. The Ball canning jars were another “must use” for me. We have more than three in the collection, but three seemed to be the right amount for the exhibit. Don’t be afraid to use identical items for your exhibit, especially in a grouping or to add an interesting sense of regularity to an odd mix of items. Notice that these glass jars are put in the middle of the table. That will prevent people from knocking them off an edge. Ball canning jars at various levels. I wasn’t satisfied with the Ball jars all being on the same level, so I used clear exhibit stands of 2 sizes to give them a stair-step pattern. Once the Ball jars were elevated, the straw hat begged to be raised even more. Note the other empty exhibit stand in the photo. Clear plastic boxes and stands are great for exhibit use because they “disappear” in the exhibit. If you don’t have clear stands, you can elevate items using books related to your theme or old paint cans and other sturdy containers, boxes, or crates. Make sure the containers you use are clean, dry and stable enough to hold display items. 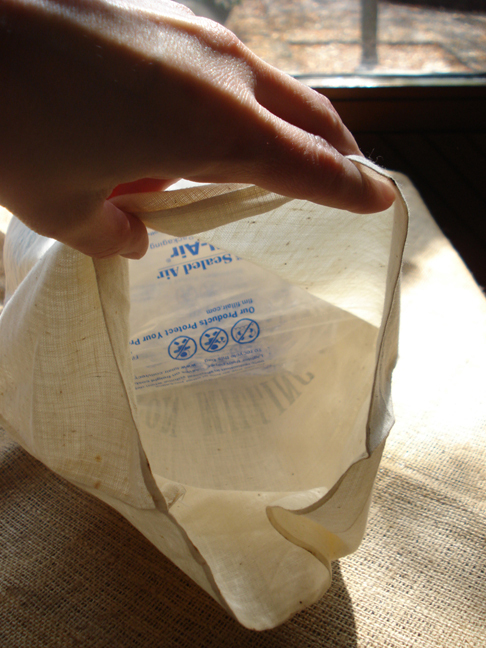 If these repurposed containers are unsightly, cover them with fabric. 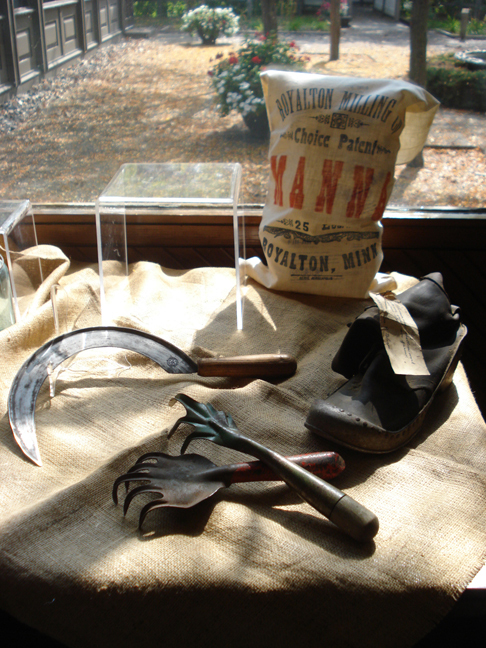 Rakes and boot become part of exhibit. The boot on this exhibit did not have a match within our collections. No matter. It’s interesting on its own because it has a metal sole. One rake holds up another, lending to visual interest. A sickle joins the rakes and boot. The sickle is perhaps the most worrisome part of the exhibit. We had pulled this from collections storage a week or two prior to building the exhibit. We definitely did not leave this laying around in a public area, for obvious reasons. In order to give it a bit more dimension, I used a small, clear picture easel to rest the blade in. A vegetable grater is leaned against the window. 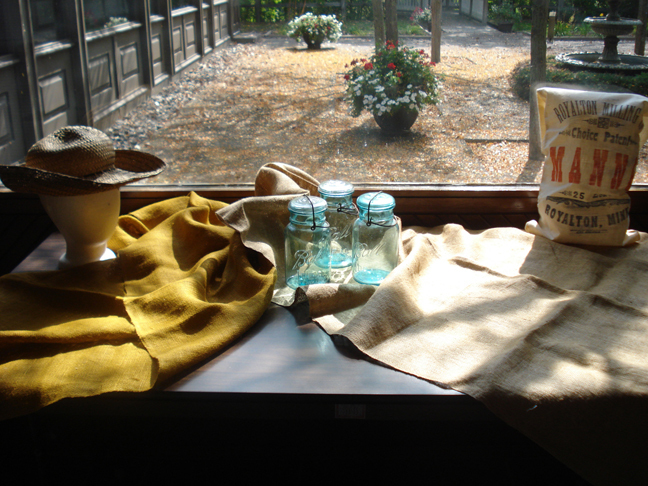 We used the window as exhibit furniture for both the flour sack and the vegetable grater. If your table is up against a wall, you can use that instead. Can you see the 3 new pieces? 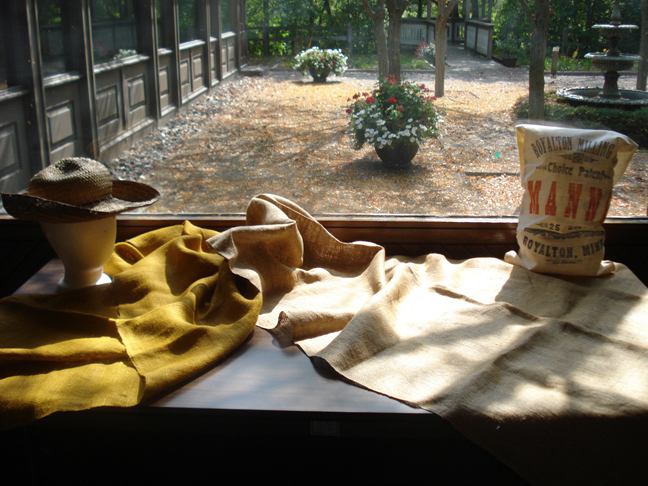 Another flour sack – we picked a different style for variety – has been added, this time without stuffing. A photo adds a great deal of detail, plus its own story to the exhibit. The apple press/strainer was loaned to the museum by a board member specifically for the exhibit. 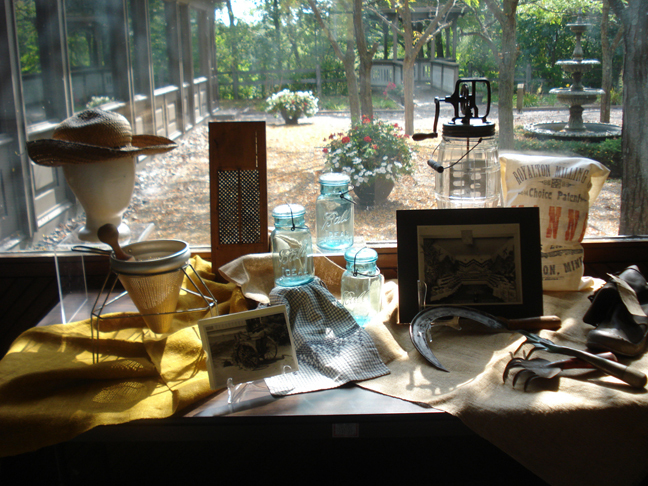 In order to fill in historical, narrative, or visual gaps, Weyerhaeuser Museum staff and board members often temporarily loan items for exhibits. We keep notes of who has loaned what, along with appropriate contact information, and return items as soon as an exhibit is dismantled. Another photo & a slight shift. Another photo has been added directly above the previous photo. (Remember the exhibit cube underneath?) This is not ideal, the 2 pics in one place, but the smaller photo is serving as a placeholder while I scour the museum for a specific artifact I want to display. The slight shift is with the second flour sack. A corner of it has been placed under a Ball jar. Tweaking an exhibit as you go is perfectly acceptable. If more than one person is involved with setting up an exhibit (as occurred with our garden exhibit), tweaking is unavoidable as well. Each person has his/her own sense of aesthetics, so each will have his/her own ideas about how the exhibit should look. Ideally, there should be one person in charge of the majority of the design, but that person should be open to feedback from the others involved. The second photo has been moved. Much better. The placeholder photo has changed locations, an artifact having taken its place. 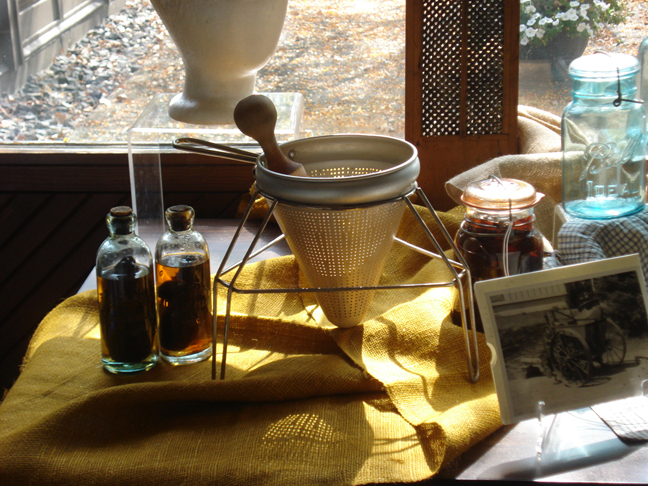 The glass butter churn was loaned by the board member who provided the apple press. The churn provides a better balance to the rest of the exhibit and now the photos aren’t on top of each other. Old pickles in Little Falls Bottling Works bottles. 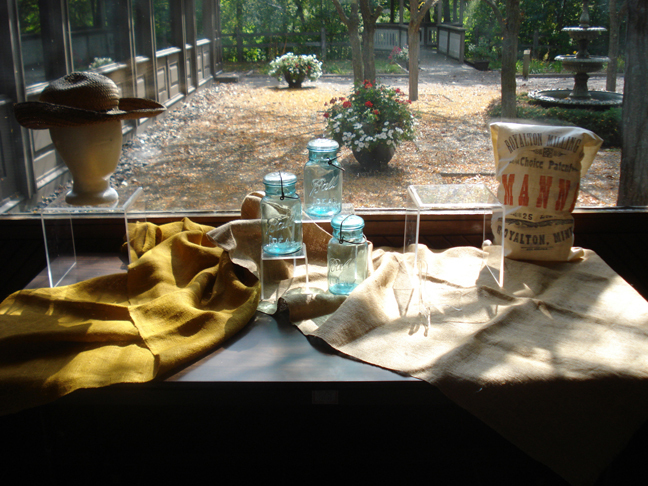 I took time during the exhibit-building to find these bottles of old pickles for the display. 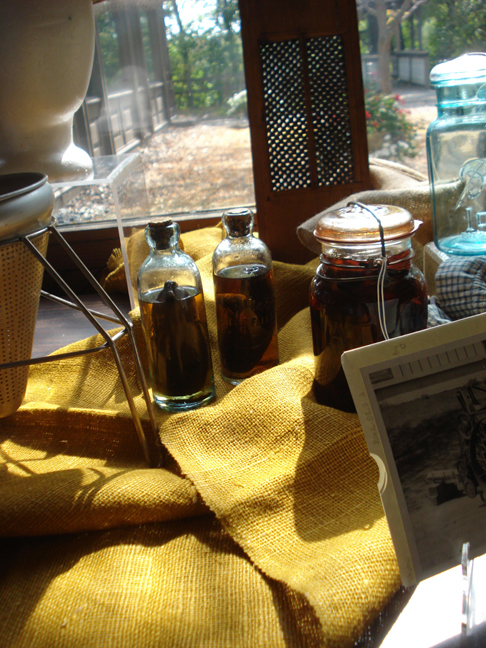 Notice, too, the historic jar of prunes behind the photo. Eventually I had to break down and ask our curator where to find these because I couldn’t figure out where they’d been put in the museum collections rooms. I really wanted to use them, though, because they make great conversation pieces. My intention was to put them where the butter churn ended up, but the butter churn arrived first. The pickle jars were moved for their own safety. Ta da! The finished exhibit! Visual flow around the exhibit. Heights and levels of exhibit. With a bit of practice, exhibit-building can become a fairly easy exercise. Dismantling it all is a piece of cake … as long as you can remember which boxes you took the artifacts out of. Note: Labeling an exhibit is another process altogether and tends to take more time than building the exhibit itself. While labeling is important, it’s not always necessary, particularly for a very temporary exhibit like the one above, which was displayed for less than a week. Thanks Mary. It was fun following along with you. Also encouraging for me as we start from scratch developing exhibits for our heritage centre. Do you know of other sites where I might find help with exhibit design and construction? Hi, Stanley. Glad you liked the post. I hope these are helpful. If you run across any other good exhibit resources online, please share them here. Thanks Mary. I had seen a couple but the others are new to me and should be a great resource. That is an awesome quick exhibit! Kudos to you! Thanks for posting such great visual aids and directions for setting up a display! I’m in charge of archives for a county government but have been given the task of setting up 2 display cases with post office memorabilia as the building used to be the post office (built in 1910). As I do not have a museum or art background, I’m learning as I’m going. This has been most helpful! I’m so glad we could help, Pam. Good luck with your exhibits! Wow great job on building an exhibit in just an hour. Awesome pics too btw. Thanks for this! I was really inspired and I am doing a similar thing on sea otters and I have no background. (Am excited though!) Lots of “resources” out there like the ones you have mentioned yet they aren’t really a help because they are for whole exhibits. Thanks a whole lot! You’re welcome, Martha! Good luck on your exhibit! Do you have any tips on building one for a school project? Hi, Mybuttia – I’ve thought about how to help students build an exhibit and one thing I think would be useful is to have them bring things for the exhibit so they feel they have ownership of it. As for teaching them how to arrange the items on an exhibit, it would be great to pull in the art teacher in the school and have him or her show the kids basic design principles that help lead people’s eyes through the exhibit. Also, showing students how important white space is to allowing the eyes to rest would be a good principle to learn. 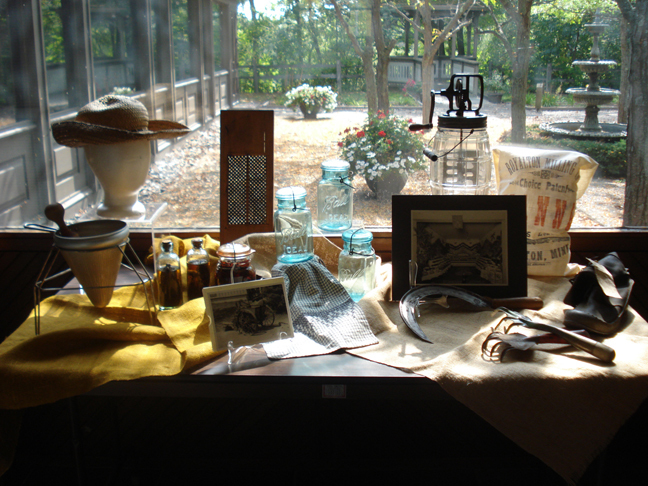 Pulling in a writing instructor would help teach students how to write exhibit labels. A major headline, plus secondary headlines, and then further description, using a readable font in the appropriate sizes … all of these structural elements help people to navigate an exhibit label. Then, of course, it’s learning how to convey the exhibit’s story succinctly and sensitively so that people will actually read the label. That’s something museum professionals always struggle with. I hope these suggestions help for translating this into a school project. Informative post. Great efforts to build an exhibit, museum within 1 hour. I really appreciate it. Thanks for sharing the post!! It a very well designed museum exhibit. It is a very tough job to create a museum exhibit in an hour. It requires proper attention and knowledge of presenting the things in a fine way. I liked your post and hope to see more post from your side.